No. You cannot use this native integration. Only for CRM Online. It will work if the instance is internet deployed according to me. Thanks for all your posts. They are really helpful. 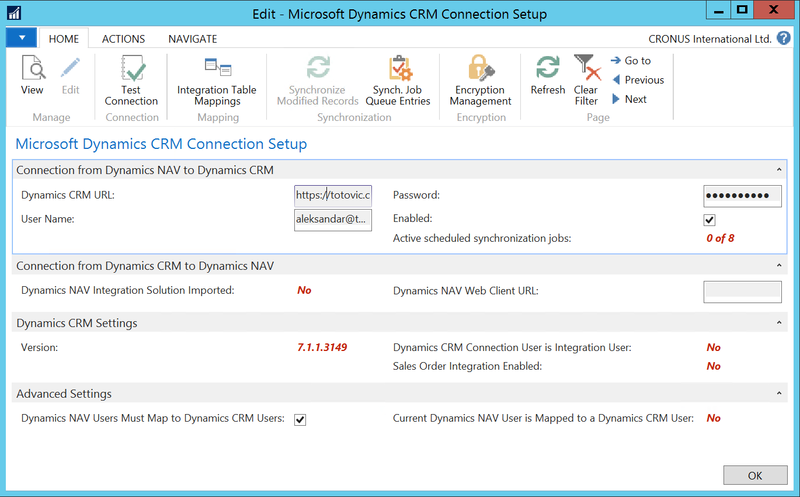 Does the nav 2016 need some other license than the extended one In order the customer to use the crm integration? NAV doesn’t need some other license, but you need CRM Online license as well. But from NAV side, Extended pack is enough. now i had done setup related to crm connection to nav done . my salespeople from navision is gating sync with crm user in online 365 crm . Table connection for table type CRM has already been registered. is that user require office 365 authentication active ? is that user require Access control service authentication status registered ? if yes than how i have to registered user for ACS Access ? Should I create the price lists and products in crm before doing the integration or synchronization can be created from NAV? The standard cost and current cost fields are natively integrated? I need to create a new field in the entity order of type lookup which field type corresponds in NAV, do I run any command in powershell or can I perform synchronization via interface?